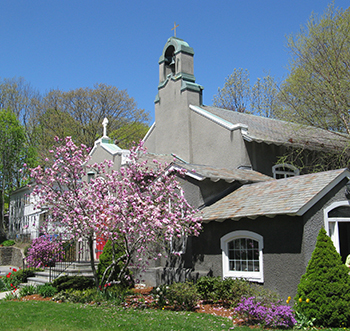 St. Luke’s is a neighborhood parish of the Episcopal Church in Worcester, Massachusetts. We come from a variety of faith traditions and in some cases no tradition at all. We are liberal and conservative, old and young, men and women, families and singles…a cross section of the human condition seeking after the Divine and trusting that God is revealed most completely in Jesus, the Holy Scriptures, through the Holy Spirit, and in a community of faith which is informed by hope and motivated by love. Closing in soon on our 110th year as a faith community in the Tatnuck Square area of Worcester, we seek to serve the world in Jesus’ name as we worship, learn, grow and journey along the disciple’s way with Jesus Christ. Sunday worship is at 8 AM and 10 AM. Though we are a small parish, we strive to offer nursery care and Sunday School at the 10 AM service. On Wednesday mornings we have a small, quiet service at 7 AM, often followed by a light breakfast and informal conversation. Children and growing in the faith are important to us. We started as a Sunday school for folks on the west side of Worcester in 1908. Our annual summer VBS (Vacation Bible School) draws many young people and attendees from around the neighborhood. Education, formation, faith development, hospitality, service and worship have been at the core of congregational life since our inception. May God richly bless you and those whom you love and who love you!